Unique recipes for C#, that places it in its real-world context. You will be able to get yourself out of any coding-corner youve backed yourself into. All code samples available through GitHub to bring C#. In line with modern development workflows, written to the latest specification of C# 6.0. 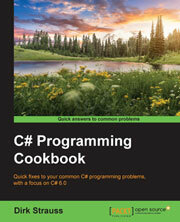 The book is aimed at developers who have basic familiarity with C# programming and will know the VS 2015 environment. Unique recipe-based guide that will help you gain a solid understanding of the new concepts in C# 6 and Visual Studio Enterprise 2015 in a concise and technically correct manner.